Jacksonville, FL -- The Mississippi Braves (36-28, 65-69) were not in a must-win situation on Thursday night in Jacksonville, but it felt like it after a Tuesday afternoons heartbreaking loss to Biloxi. The M-Braves responded to their backs being against the wall with a pair of one-run victories over the Jacksonville Jumbo Shrimp (25-40, 53-80) at the Baseball Grounds of Jacksonville. 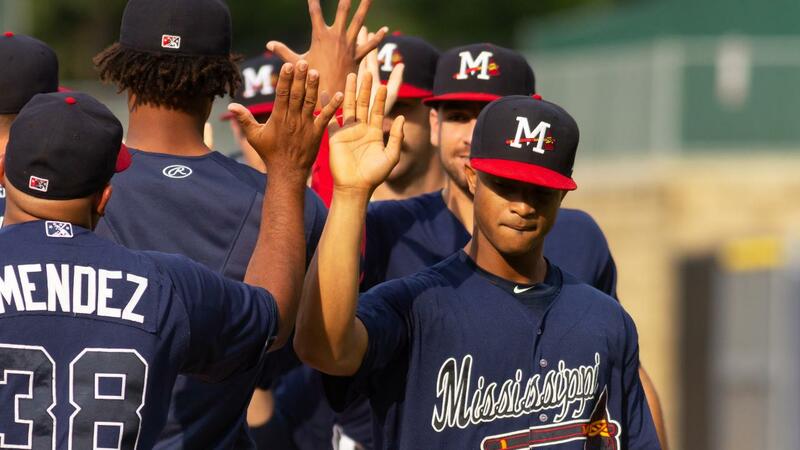 Mississippi opened the six-game series in five days with a 4-3 victory in game one and posted their 13th shutout of the season in a 1-0 win in game two. The wins on Thursday keep the M-Braves in third place in the Southern League South race, but only a half-game behind Pensacola for second place and a full game behind Biloxi. Both teams won on Thursday. The M-Braves tied and took their first lead of the game in the top of the third inning. Carlos Martinez opened the frame with a single and then advanced to second on a sacrifice bunt from Mader. 19-year-old Cristian Pache singled home Martinez with two outs to tie the game at one. Jacksonville catcher Rodrigo Vigil made an errant pickoff throw to second base and Pache sprinted all the way home to give Mississippi a 2-1 advantage. Mader held the Shrimp off the scoreboard until the fifth inning when John Norwood blasted an opposite-field solo homer to tie the game. As Jacksonville took the field in the top of the sixth inning, heavy rains hit The Baseball Grounds and play was halted for 1 hour, 5 minutes. After the rain delay, Mississippi pushed two runs across against Jacksonville reliever Kolton Mahoney (L, 3-9). With two outs, the M-Braves recorded four straight singles including RBI knocks from Tyler Marlette and Jonathan Morales . The Braves led again by the score of 4-2. Josh Graham (H, 2) took over for Mader after the delay and pitched a scoreless sixth inning. Graham struck out the first batter of the seventh inning and then surrendered a walk and single. With two outs, Graham walked two more to force in a run and make it 4-3. Manager Chris Maloney called on red-hot reliever Thomas Burrows (S, 4) to get the final out and he delivered. Burrows struck out Marlins top prospect Monte Harrison for the final out, stranding the bases loaded. Burrows earned his fourth save and hasn't allowed a run over his last seven games and 10.1 innings pitched. Mader notched the win and struck out two over 5.0 innings of two-run baseball. Game two was a game of missed opportunities for the Jumbo Shrimp. M-Braves starter Elian Leyva pitched out of trouble through his entire start but gave up no runs. Jacksonville stranded multiple runners in three innings and nine for the game, finishing 0-for-11 with runners in scoring position. Jacksonville starter Jordan Yamamoto came off the disabled list and pitched six no-hit hittings before being lifted after throwing 63 pitches. Tommy Eveld (L, 2-1) took over for Yamamoto. After retiring Neslony, Travis Demeritte tripled to the gap in right-center field for the first hit of the game. Eveld induced a pop out from Marlette for the second out. Luis Valenzuela hit a slow grounder down the first base line and reached when first baseman John Silviano failed to touch the base. Demeritte scored the M-Braves led 1-0. Justin Kelly (W, 1-0) relieved Leyva and posted his first M-Braves win in a stellar performance. Kelly tossed 2.2 hitless innings and struck out four, including two in the bottom of the seventh inning. Leyva struck out five and walked three over 4.1 innings and 97 pitches in his fourth start. Demeritte finished the twin bill at 3-for-6 with two runs scored and had the lone hit in game two. With the win, Mississippi improved to 33-22 since July 1, 16-10 in August and 10-7 against the Jumbo Shrimp this season. The M-Braves and Jumbo Shrimp will continue their six-game series on Friday night with just one nine-inning game. LHP Kyle Muller (4-0, 2.25) will look for his fifth-straight win on the mound and will face off against Jacksonville RHP Nick Neidert (11-7, 3.31). First pitch is set for 6:05 pm CT with coverage beginning at 5:50 pm on 103.0 WYAB, TuneIn Radio, and MiLB.TV. The final series of the regular season will continue through Monday in Jacksonville with a doubleheader on Saturday, off day on Sunday and single game on Monday.